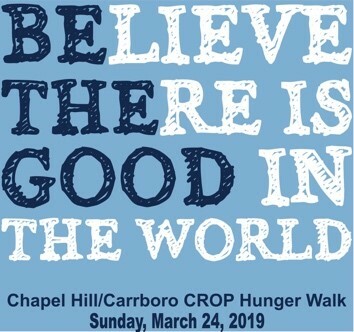 The 32nd annual Chapelboro CROP Hunger Walk is on Sunday, March 24, 2019. 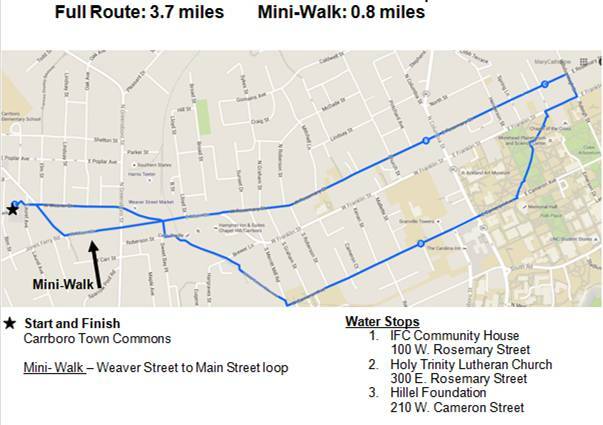 The walk is a 3.7 mile or .8 mile family-friendly stroll through Carrboro and Chapel Hill, including UNC-Chapel Hill. Walker registration starts, and walkers step off from Carrboro Town Commons at 2:30 p.m. The Church World Service, established in 1946, distributes 75% of the money from the CROP Hunger Walk to global hunger education, refugees, disaster relief, and self- help projects in more than 80 countries. The remaining 25% of this walk stays in the Carrboro-Chapel Hill area to support IFC's hunger-relief programs, such as the Emergency Food Pantry and Community Kitchen. Carrboro and Chapel Hill area and neighboring religious communities, businesses, schools, non-profit agencies, organizations or any person who wants to contribute their time and/or money to help support those in need. How to help? Become a walker, sponsor a walker, donate online at www.crophungerwalk.org/chapelhillnc, volunteer to assist with “day of the walk” needs, visit us on Facebook, or share this info with your community. Contact the Chapel Hill/Carrboro CROP Hunger Walk Coordinator Mae McLendon at mmclendon@ifcmailbox.org for more information. Download the 2019 fact sheet, and share it with your friends, family and colleagues.